The first thing you’ll notice is the 3 band EQ. With this, you will be able to sculpt your tone like never before. We’ve also added bright and bass boosts, so you can get that fresh tone or the thump of a 4x12". Then, we added the “Valve Screamer” based pre gain boost (that you can use when the pedal is bypassed) – we all know how good this style of circuit pushes gain stage...Then, the secret weapon. One the side is the SAG switch. 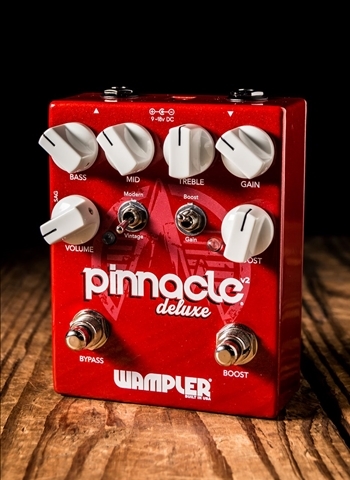 This can allow you to remove that saggy crunch and tighten the response up dramatically, so – this v2 offers not only an updated take on a Wampler classic, but also a plethora of new features that will be irresistible to tone chasers everywhere! -3.5" x 4.5" x 1.5" (88.9mm x 114.3mm x 38.1mm) – height excludes knobs and switches.